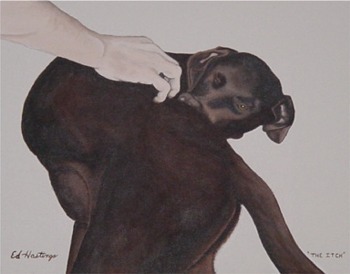 These are some photos and paintings of my dog Schmoquee who was the inspiration for BigDogGalleries. Unfortunately Schmoquee's life was cut short due to cancer and he passed away in May of 2005. 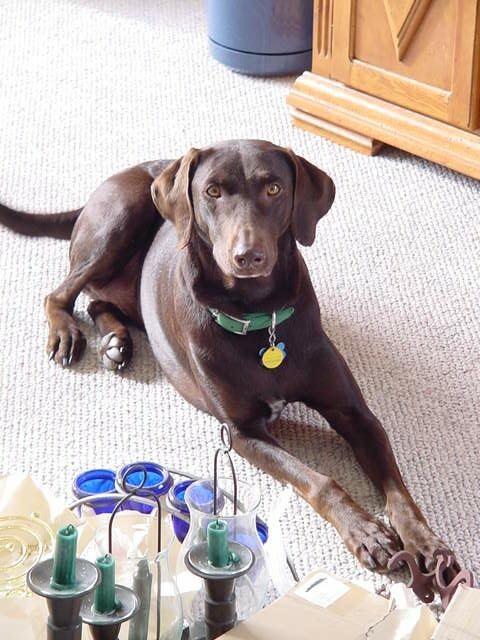 He was a wonderful dog and companion and will never be forgotten. Here he is posing next to one of the first watercolor paintings I ever did of him. I have never painted this photo of Schmoquee but it's one of my favorites. This is one of my favorite paintings of Schmoquee. He had an itch one day and I was helping him scratch it. I took a photo with my other hand and was lucky enough to capture his expression and body position perfectly. We adopted Schnitzel (left), a blue Weimaraner from the Colorado Mile High Weimaraner Rescue in January of 2009. He was rescued from a kennel in Kansas and was about 14 pounds underweight when we got him. After a couple of months he was back to his normal weight and is doing fine. He is one of the family now and has turned out to be a wonderful dog. 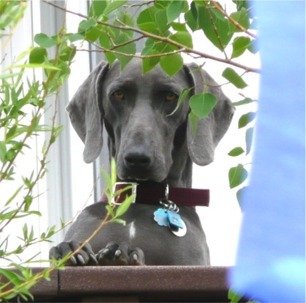 Schtrudel (right) is also a Weimaraner and was adopted from the Rescue in September of 2009. Both Schnitzel and Schtrudel get along great and have become best friends.